Polygyros Town Hall (Dimarcheion), designed by Xenpohon Paionidis. is currently closed for renovation. Polygyros is a small inland town which serves as the administrative capital of the regional unit of Halkidiki, Macedonia, northern Greece. It is set among the woods and farmlands at the southern foot of Profiti Ilias (Prophet Ilias) hill, part of Mount Cholomontas (or Holomontas, Greek, Χολομώντας), one of a chain of mountains which separates central and southern parts of the Halkidiki peninsula from the rest of Central Macedonia. The town's main tourist attractions are the Folklore Museum (Λαογραφικό Μουσείο Πολυγύρου) and Archaeological Museum (see Polygyros gallery page 1), both of which are currently closed. Otherwise tourists may spend some time walking its narrow streets lined a mixture of traditional and modern architecture or visiting one of the shops, restaurants, cafes and bars. The modest architectural attractions include the Town Hall (Δημαρχείον, Dimarcheion), Agios Nikolaos church and the Six Fountains (Έξι Βρύσες, Exi Vrises). Polygyros also has a number of parks, statues of local heroes (including Aristotle) and a modern open-air theatre which in summer presents plays and concerts. Many visitors will pass through on their way to or from the nearby archaeological site of Olynthos (24 km southwest) or one of the seaside villages to the south; the small bus station on the edge of town connects some of these destinations with Thessaloniki. The countryside and mountains also attract ramblers, cyclists and hunters. Game, including wild boar, is served in local restaurants. The 890 metre high peak of Tsoukalas, just to the north of the town, offers a good view of southern Halkidiki and its three peninsulas. The two most lively times in Polygyros are during the Apochrias (literally without meat) Lent carnival, and the Panagia (also known as Polygyri) festival of the Virgin Mary on 15th August. During Apochrias people go crazy, walking through town in bizarre costumes and hitting each other with plastic clubs. The Panagia, which draws in people from the entire area as well as returning locals who live elsewhere, involves much communal eating, drinking and dancing in public squares. Polytechniou 50, Polygyros, Halkidiki, 63100 Greece. 37 Odos Polytechneiou, 63100 Polygyros. on the main road (Ippokratous), north towards Galatista. The museum is closed for for an indefinite period. See Polygyros gallery page 1. Odos Stadiou 1, Iroon Square, 63100 Polygyros. The name literally means "much around", which does not make much sense. The origin is not known, although there are a number of theories. It was first mentioned in an imperial Byzantine document in the 11th century AD. location: Polygyros is the name of a town and municipality in the centre of the Halkidiki peninsula, Macedonia, northern Greece. The town is the capital of Regional Unit of Halkidiki, and is the largest settlement on the peninsula. 67 km southeast of Thessaloniki and 587 km from Athens. See page 2: How to get to Polygyros. with wet winters and hot, dry summers) and continental (wetter, cooler). during summer the highest temperature is usually around 35°C. rain showers and thunder storms are common, even in summer. 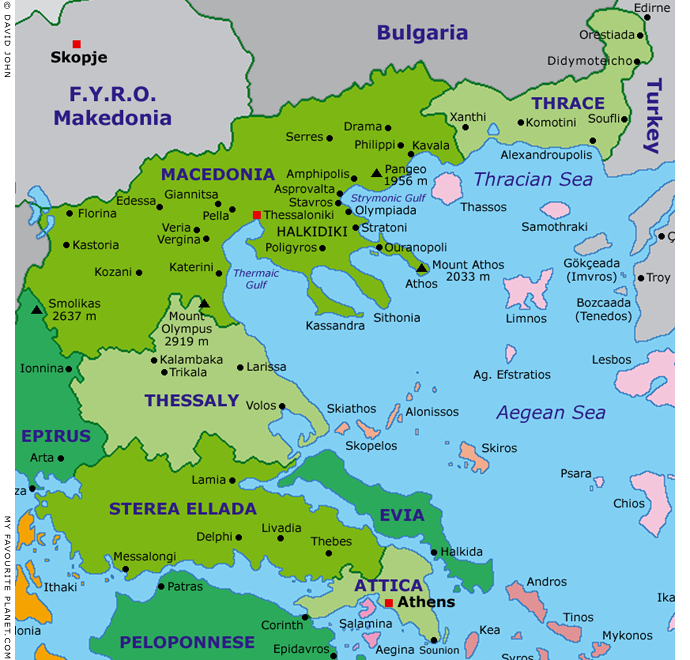 Further information for Macedonia can be found in our introduction to Macedonia pages. Wild boar, hare and wildfowl on the menu of a restaurant in Polygyros. Interactive map of Macedonia and the North Aegean Sea.